Experience one of the most significant milestones in film history like never before with To Kill A Mockingbird 50th Anniversary Edition. Screen legend Gregory Peck stars as courageous Southern lawyer Atticus Finch - the Academy Award winning performance hailed by the American Film Institute as the Greatest Movie Hero of All Time. Based on Harper Lee's Pulitzer Prize winning novel about innocence, strength and conviction and nominated for 8 Academy Awards, this beloved classic is now digitally remastered and fully restored for optimum picture and sound quality and boasts hours of unforgettable bonus features. Watch it and remember why "it's a sin to kill a mockingbird". 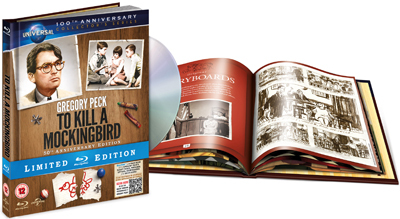 Limited Edition Blu-ray packaging with 44 page bok with Gregory Peck's script pages, personal letters, storyboards and much more! A Conversation With Gregory Peck - A feature-length documentary on one of the most beloved actors in film history with interviews, clips, home movies and more. Academy Award Best Actor Acceptance speech - Gregory Peck's speech after winning the Academy Award for his performance as Atticus Finch. Excerpt from "Tribute to Gregory Peck" - Cecilia Peck's farewell to her father given at the Academy in celbration of his life. To Kill A Mockingbird... out of all movies I have seen in the Cinema or bought on DVD or Blu Ray, this has to be one of the finest pieces of movie making for all to see. The acting, or maybe it is not merely acting, is what makes this movie so watchable, there are plenty more in this guise, Gregory Peck gives a flawless performance, it is as if he was the lawyer in reality and not just playing the part, so this has to be a piece worth watching for anyone. Strongly recommend. To Kill A Mockingbird is a classic film that has finally had the ultimate release that it deserves. The set comes in a great digi-book with a brilliant set of extras including various documentaries. The picture has a perfect high-def picture and great high-def audio. Would highly recommend this to anyone who is a fan of the book or film, as well as newcomers. To Kill a Mockingbird is literally one of the best films I've ever seen. Gregory Peck is outstanding as the lawyer Atticus Finch, who in racist and segregated times had a social and moral conscience. The acting throughout is faultless. There are also a truckload of extras to accompany the film including a feature length documentary on the making of the film, including interviews with the cast. A stunning film.